Are you warm or cold-natured? What is the most extreme temperature change you’ve experienced? To what extent do you feel pressure to live up to a certain standard to others so that God is honored? Color requires light. It can’t exist without it. But that’s not the only benefit of light. Light is nourishing, and it gives off warmth. 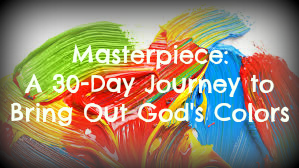 Being God’s masterpiece isn’t just about how we look to others. It’s a more comprehensive experience for people who cross our paths. We impact their lives in powerful ways; rather, God impacts their lives in powerful ways through us. Have you ever noticed how relative the feeling of warmth is depending on what you’ve become accustomed to or where you live? Someone travelling from Florida to Colorado would say Colorado is cold. Someone from northern Minnesota would disagree. At the end of winter, people wear no coats on a temperate day. But at the end of summer, people are wearing jackets on a day with the exact same temperature. Temperature itself is not relative. Our experience of it is. The same is true when we interact with each other. What one person says is friendliness, another will define as standoffishness. What one person says is generous, another will say is stingy. We cannot control how others respond to us. We can’t figure out exactly what we need to do to get a specific reaction from individuals, to make them feel God’s warmth. Instead of trying, we can put all of our effort into following God. When we bask in His warmth, we absorb it. We then live with it. We still don’t know how people will respond to it, but God does. We don’t have to control all the details—just be obedient. God’s warmth will nourish us—and others. Invest in someone’s life today. Contact someone you’ve been encouraging and take the next step. Watch for someone you don’t have much of a relationship with yet but plant the seeds of encouragement with a smile and brief word. Appreciate when others encourage you—with a word, kind deed, or smile. Do you struggle with withholding too much information or sharing too much? When you think of “authenticity,” what words come to mind? Many displays have lights that highlight them—museum displays or outdoor parks and monuments. The goal is to highlight them, but the light never completely reveals everything. In fact, the lights often create glares, shadows, or distorted proportions. When the focus of the light has more than one dimension, the perspective of the light affects the perspective of the person looking at the display. The light is intended to illuminate the object, but it ends up presenting it in a less-than-authentic way. Do you ever do the same with your life? We sometimes try to highlight what we most want people to see. We don’t mind if other aspects get downplayed or ignored, because we don’t really like some of those aspects of ourselves and our lives. Besides, we can’t be an open book to everyone, right? Of course, we can’t share everything with everyone, but what we share with people needs to be truthful and authentic. Everyone in our lives, even those who know us best, will only see pieces of who we are. Those who know us best don’t know everything about us, and if they did, because we’re always changing, they would have to constantly get to know us, over and over. Even we don’t know ourselves completely. Only God does. When I answered, “Fine,” to the standard “How are you?” question one morning, I thought, “Why am I lying?” It’s not that anything was terrible, but I was grumpy. The woman who had asked me struggled with depression, and I often encouraged her. I guess I didn’t want to vent to her, of all people. But I asked her to ask me again. Confused, she did. When I told her I was actually kind of grumpy and briefly summarized why, her frown turned into a smile. I was puzzled and asked her what was so funny. She replied, “I just didn’t realize you’re like me!” I chuckled. Yes. When we’re authentic with each other, we find we have more in common than we thought, and we can encourage each other along the way. Let God’s light shine on and through you. At least He knows what to highlight when and to whom. Grab a flashlight, turn it on, and hold it against your skin just under your chin. Look in the mirror. How does it distort your image? Commit to letting God highlight you as He created you to be instead of trying to decide what features to highlight and downplay.